Road bike or mountain bike? At Dead Horse Point State Park you can do both. However you prefer to bike, with phenomenal landscapes, views, challenging and not so challenging routes, Dead Horse Point State Park will be an unforgettable and worthwhile journey. 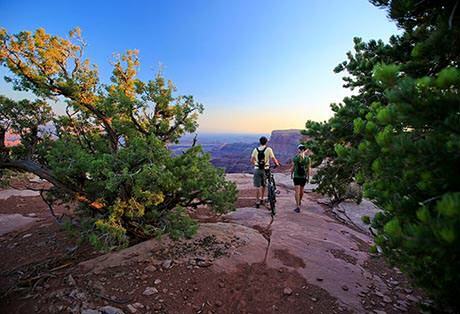 The Intrepid Trail system was opened at Dead Horse Point State Park in 2009, and doubled in length in 2013. The 16.6 miles of non-motorized singletrack trails winds through a thriving desert landscape of juniper and pinyon trees, slickrock, and mixed terrain. Most trails are moderate to intermediate, however there are a few trails that can be enjoyed by beginners. 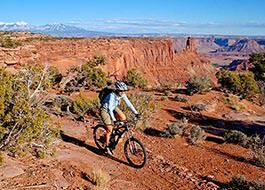 Check out the guided Mountain Bike Adventure at Dead Horse Point! 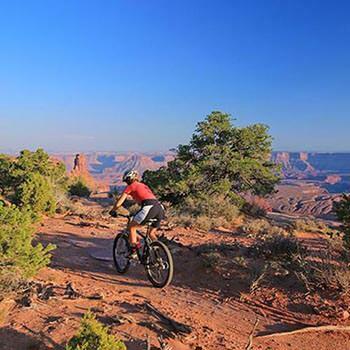 Road biking from Moab to Dead Horse Point is a serious cyclist’s dream. The 41 mile, 3,800 ft elevation gain trek begins on a paved trail alongside route 191, crosses the Colorado River, passes Arches National Park, and takes you through a stellar canyon to the junction of Highway 313. Highway 313 is a steep and winding canyon road with a generous bike lane. The higher you climb on this 24 mile section of road the more grandiose the scenery becomes. 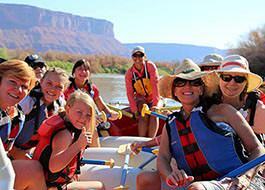 You’ll take in views of the Henry, Abajos, and La Sal mountain ranges before arriving to Dead Horse Point State Park. At the park, treat yourself to a refill of water at the visitor center and enjoy scenery that will leave you breathless. And it will have nothing to do with your epic ride.